Diana Johnson's paintings of land and sea. Painting Maine's colorful peaceful places. The focus of my work is the Maine landscape. 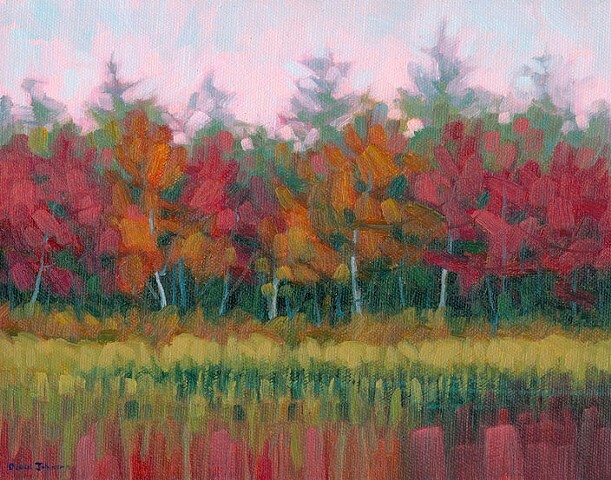 Painting is my way to share what I notice about the natural beauty of Maine. Standing at my easel in a field, cove, or marsh I enjoy the warmth of the sun and the feeling of the air moving around me. My first impression of a scene becomes a lasting impression when I paint it. "To gaze upon one of Diana Johnson's paintings is to travel through space and time to a place you may once have been or may yet to go, creating a longing for a certain feeling or ethereal quality that experience tells us is good." I work primarily in oil and pastel. The more a painting seems to emit energy, as if from the paper or canvas itself, the happier I am with the results. I try to suggest, with pigment, the essential vitality and liveliness that is inherent in tranquil, peaceful places. I am honored to retain Signature Member status with the Pastel Society of America. My works are exhibited in Maine galleries and have been included in New York exhibitions at the National Arts Club.